The time has come, folks, DJI is launching new products: drones and more. August 23, 2018 is DJI’s rescheduled event from earlier in which we expect to see the new Mavic 2 in two variants, then maybe a Mavic Enterprise drone and more. Leaks and rumors have all but confirmed the DJI Mavic 2 Pro and DJI Mavic 2 Zoom. No doubt these may be the star of the show, but some believe a Phantom 5 is on deck and some great accessories for the Ronin-S camera gimbal. You can follow along with the live stream here! We are still unsure if we are about to see two new Mavic 2 drones, or if this is an interchangeable camera system. Either way, the industry is sure we’ll see the DJI Mavic 2 Pro and DJI Mavic 2 Zoom. Both Mavic 2 drones are rumored to look a lot like the previous DJI Mavic Pro. The new machine(s) are to be faster, quieter and stay in the air longer. 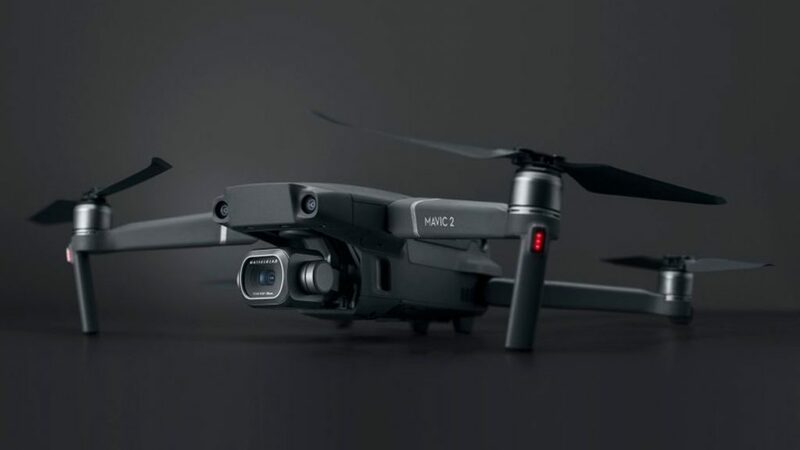 The Mavic 2 Pro will be equipped with a 20MP, 1-inch Hasselblad camera. The Mavic 2 Zoom will see a 1/1.7-inch sensor, but then offers a 2X optical zoom and some digital zoom on top of that. An early leak showed a Mavic Enterprise drone. We know very little about this machine, if it is a real thing. It appeared to be the new Mavic 2 platform but with dedicated mounting points on top for commercial operations. We imagine spot lights, infrared sensors and more. We do not know of an official name for this, but an early leak also showed what appeared to be a hand-held mount for the new Mavic 2 cameras. This assumes that the cameras on the Mavic 2 are removable, which we are really hoping is the case. We have low confidence that this will be announced as expected, but we can certainly hope for it. Let us be perfectly clear, we have no expectation that DJI will announce the Phantom 5 at this event. We hope we are wrong. We only mention this because we’ve seen claims this new drone is on deck. We’ve covered our hopes and expectations of a Phantom 5 in our Phantom Drones guide. DJI’s one-handed large format hand-held camera gimbal system has been a solid operator for DSLR camera users. The Ronin-S is a great tool for getting silky smooth video capture with your camera on the move. The system has accessory mounts for things like Master Wheels, controllers and lights, some of which have already been announced. We expect to see some of these tools go live at this event. Let’s be fair, DJI has gone to great lengths to keep secrets about this event. We hope that they have a surprise or two for us. Be sure to stay tuned, we are in the crowd at the event, absorbing the details and putting hands on the new drones. We’ll have plenty of drone coverage coming for you very soon.